Why Have Your Chimney Cleaned or Sweeped? We all love fireplaces. After all, few things can compare with the warm comfort of a roaring blaze on a chilly night. But a fireplace can also be a source of danger, if not properly cared for. Each year, fire prevention experts say, lives are tragically lost and millions of dollars in property damage sustained due to chimney fires that could have been prevented had the homeowner adhered to a simple chimney/fireplace maintenance routine. That routine should include regular chimney cleaning. The importance of a clean chimney cannot be underestimated: the chimney and the flue inside it are responsible for carrying the smoke away from the fireplace and out of the house. A clean chimney helps the fireplace function efficiently, and it prevents the buildup of flammable creosote. One of the byproducts of that crackling fire we so enjoy, creosote, is carried by smoke into the chimney. Some of the creosote coats the walls of the chimney. If the creosote becomes too thick, it can catch fire. Chimney fires can quickly spread to other parts of the home. Heavy creosote can also hinder the flow of carbon monoxide, a dangerous, odorless gas, through the chimney and outside the home. Carbon monoxide can be a silent killer. A clean chimney will also ensure that your fireplace is operating at peak efficiency, which will provide the most heat while also reducing the amount of smoke that gets into the house. So, how often should I clean my chimney? 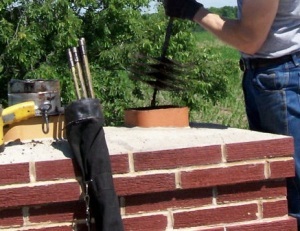 Is chimney cleaning a do-it-yourself job, or a task better left to professionals? Experts would always recommend having a CSIA certified professional do the job. Cleaning is a dirty job that can require some climbing and strenuous activity. And besides keeping the chimney clean, a professional chimney cleaning company, typically called a chimney sweep, is also better qualified to detect potentially dangerous flaws that need repair.